It turns out The Sims 4's new weather can kill. Expand your game with our round up of the very best Sims 4 mods. The Sims 4 Seasons expansion adds new stuff for your sims to do in different weather conditions. This weekend I learned that some activities do not mix well with certain conditions. It wasn't my neighbourhood, to be clear, it's my girlfriend's. Some horrified noises alerted me to the fact something was going quite wrong. It started with one death outside a gym. When a Sim dies of cold they turn blue, fall over, and then become cocooned in ice, and then turn into an urn. This is such a bizarre and horrifying spectacle that it attracts the attention of other Sims in the area. The problem is they are all dressed for exercise in the gym, and as they come outside a few of them start turning blue as well. By the time we notice what's happening, three Sims are already down. Soon brown-shirt guy starts looking a little peaky. Oh no. No, not brown-shirt guy. Not like this. The grim reaper turns up right away. 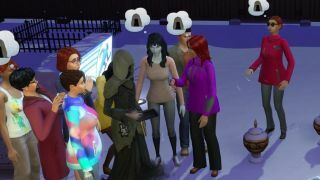 This makes matters worse because Sims can see Death, which encourages them to rubberneck, then they start to actually freeze, and their deaths draw an even larger crowd. You never know what you'd really do in a disaster scenario. The Sims have varying reactions. Some are heartbroken. Some are extremely concerned with the fact the embodiment of death is in their yard. One lady really needs the toilet. The game gives you a lot of warning before one of your Sims freezes to death, but we let it play out, out of morbid fascination. By the time the chain ends we've lost eight Sims to the snow. RIP. Wrap your Sims up warm out there, folks.